Travis and Jess with their Peggie! GPSA started a new tradition at our January meeting last Tuesday. Recently, our board decided that we wanted to do more to recognize the strong sense of community that makes living at Gangplank Marina so special. That sense of community exists due in no small part to the small acts of kindness that slipholders impart to one another on a regular basis. We decided GPSA should create an award to recognize these deeds that form the foundation of our community. The award would be called the Peg Leg Award and be given in recognition of being a good neighbor. Why a peg leg? Because we live on boats! And because we think that a good neighbor often provides support beyond what we are capable of doing alone. Although the nomination period was just a few days before the first meeting, we received nine nominations for the first award. We selected five nominations randomly from a sock monkey hat, and read each one aloud at Tuesday's meeting. The fifth nominee was selected as the winner of the Peg Leg Award. To recognize as many neighbors as possible for their wonderful deeds, we decided to post all of the nominations below. 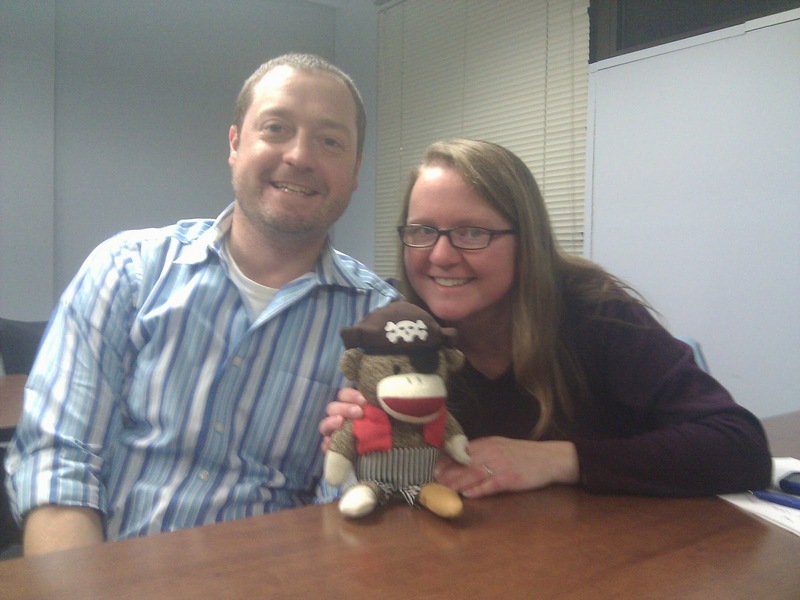 We were delighted to present the first Peg Leg Award to Travis Johnson and Jess Dankert. Travis and Jess have done amazing work to make our community a fun, inclusive place to live, including serving on the Bridge of the Port of Washington Yacht Club, and organizing the first-ever Boat Home Tour! Jess and Travis will be able to proudly display the Peggie as they choose until we present our next Peg Leg Award at our April meeting! Jess Dankert - because the floating home tour was awesome mainly due to her hard work! Liz Chambers - is an outstanding neighbor, is constantly helping and supporting the community. Joe Henderson - Joe helped me get my winter water working. This entailed sharing his plumbing expertise with me, checking my new pump installation, helping me take out my broken water tanks, and rigging up my hoses so that I'd have the water system working. Plus, the same morning he made me coffee and brought me danishes. Thanks, Joe the Plumber! Mikhael Schlossman - Mikhael came to my rescue when I fell off my ladder and came over, used his EMT experience to check and see if I was OK, brought ibuprofen for the pain, and checked back on me. The next day he went to the store and bought groceries as I had nothing in the house to eat. When I tried to pay for it he suggested I donate the money to the Combined Federal Campaign to help someone else! That's truly paying it forward. Travis and Jess - For making 2011 an amazing year! Linda and Phil Stiles - They help everyone on B-Dock. They take care of the holder's boat. They put up the holiday lights on B-Dock. They are always there when you need them, for help with maintenance, watching your boat when you're gone, coordinating dock events and a glass of wine or an ear to listen. Liz Chambers - Liz and her husband Justin are always helping their neighbors and supporting the community. Liz was a hallmark of last year's POWYC bridge and highlights this year's GPSA Board. We are lucky to have such a neighbor.